Can I buy Duac online without a prescription? Duac is a treatment for mild to moderately severe cases of acne that comprises blackheads, whiteheads, and red inflamed pimples (spots). The Online Clinic can prescribe this medication after a quick online medical form is completed. There is no need for you to send us a prescription as we take care of that for you. Just click on the free consultation button below. Duac is a topical medicine containing two ingredients, clindamycin and benzoyl peroxide, used for treating acne. The antibiotic, clindamycin stops the bacteria causing acne from making proteins that enable them to grow and reproduce. This prevents the bacteria from increasing in number, leaving them to die or be damaged and removed by your body's immune system. By clearing the bacterial infection, the pimples disappear and the skin heals. Benzoyl peroxide acts by breaking down a protein known as keratin that is found in skin cells. It breaks down the upper-most layer of skin cells, which are then shed. This not only destroys blackheads and whiteheads but helps to stop new ones from forming. Benzoyl peroxide is also an antibiotic that kills bacteria on the skin. Together, these ingredients work against the acne-causing bacteria, and treat and reduce the numbers of blackheads, whiteheads, and pimples. Duac is a gel that is used once daily in the evening. Before using the gel, wash and dry the affected skin area. A thin layer of gel should be applied to the entire area of affected skin, not only to the pimples. You are using too much gel if it does not easily rub into the skin. Ensure you wash your hands after use. Using too much gel will not make it work more effectively but may irritate your skin. If your skin becomes very dry or peels, use an oil-free moisturiser or reduce the quantity of gel that you use, or use the gel less often, or stop using it for a while. Your doctor will tell you how long to use the gel. Stopping may cause the acne to return. The treatment period should be no longer than 12 weeks. Only use the gel once a day and, if you forget, then use it once only the next evening. Contact your doctor if you accidently swallow Duac. Take care not to get the gel on your mouth, lips or eyes, or where the skin is inflamed or broken; if you do, rinse with lots of water. Your skin may be more sensitive to sunlight so do not expose the treated area to excessive sunlight or sunbeds, and use a sunscreen lotion if strong sunlight exposure cannot be prevented. Also try not to get Duac on your hair or fabrics (e.g. clothes and bedding) as it may bleach them. Adults and adolescents aged 12 years and over can use Duac. However, Duac cannot be used if you have an allergy to any of its ingredients. Tell your doctor if you have ever had inflammation of any of your gut (known as regional enteritis or ulcerative colitis), or if inflammation of your gut occurred after using antibiotics (antibiotic-associated colitis). Let your doctor know if you are using other acne medicines because Duac may reduce their effect and the combination may increase the chance of skin irritation. On the other hand, Duac may be less effective if you have recently used medicines containing clindamycin or other antibiotics. You should not use the antibiotic erythromycin at the same time as using Duac. Medicated or harsh soaps, cleansers and cosmetics (especially those containing alcohol or astringents) may also increase your chances of getting dry skin or skin irritation if used alongside Duac. Your doctor will also want to know if you are going to have any surgical procedure, as Duac may affect the anaesthetic action. If you are pregnant, trying for a baby or are breastfeeding, discuss use of Duac with your doctor before applying it. Do not use the gel on your breasts when breastfeeding. People most commonly experience red, dry and peeling skin in the area of gel application, which is usually mild. Less frequently, there may be a burning sensation or pain, or the skin may become sensitive to light. Occasionally, the skin site may tingle, become itchy and red, develop rash or the acne may worsen. Duac can also cause headaches. Duac should be stopped and medical advice sought if your bowel becomes inflamed (colitis), or you get diarrhoea (especially if it contains blood, is severe, or does not appear to be going away) or stomach pain. Side effects are relatively uncommon but you should report any side effects to us if we have prescribed the medication for you. If you are concerned about acne, Duac may be suitable for you. 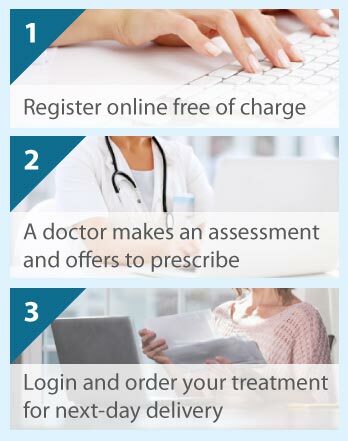 In a free online consultation, an experienced doctor will discuss your symptoms and prescribe a treatment to suit your needs. Firstly, complete the brief online questionnaire by clicking on the Free Consultation button.